LONDON (AP) Novak Djokovic shrugged off a bad call by the chair umpire that cost him a break in his Wimbledon win over home favorite Kyle Edmund on Saturday. He was robbed of a break at 3-3, 15-40 in the fourth set when the ball bounced twice before Edmund managed to return it over the net. Djokovic complained to the chair umpire but the call stood – even though TV replays also showed Edmund’s shot had actually landed wide. 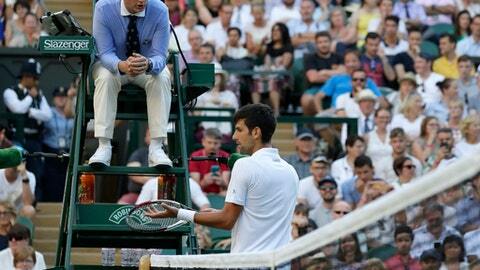 ”I was 100 percent convinced it (bounced) twice,” Djokovic said. ”I thought the crowd’s reaction after that (time violation) was quite unnecessary. A couple (of) guys really, you know, pretending they were coughing and whistling while I was bouncing the ball more or less to the end of the match at that end where I received the time violation.